LONDON: Parliament members voted 325-306 against opposition Labour’s motion, buying embattled PM time to forge new Brexit plan. 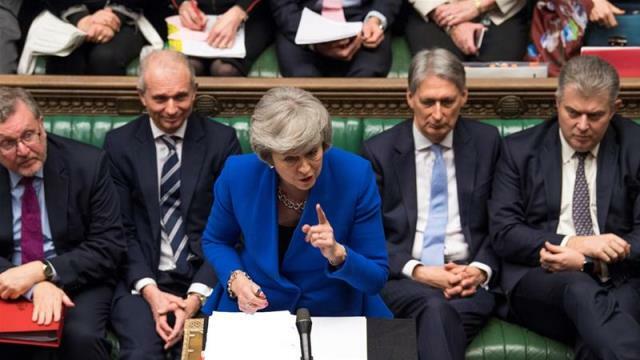 Embattled British Prime Minister Theresa May survived a no-confidence vote on Wednesday, a day after members of parliament dealt a crushing blow to the Brexit plan she negotiated with the European Union (EU). Parliament members voted 325 to 306 against the motion called by opposition Labour Party leader Jeremy Corbyn, who had urged May to resign. With her leadership secure for the time being, May has to decide the next step, as the March 29 deadline for Brexit looms. For the first time, May said she is willing to talk to the leaders of all opposition parties to reach a deal. “I believe [an election] is the worst thing we could do, it would deepen division when we need unity, it would bring chaos when we need certainty and it would bring delay when we need to move forward,” May told parliament. The other options on the table are a second referendum, a renegotiation with the EU or an EU departure without a deal. During the debate on Wednesday, Labour’s Corbyn said that the Brexit vote on Tuesday night has left May’s government ineffective to deliver on her promise. Following the vote on Wednesday, Corbyn called on May to “remove clearly” the prospect of a “no-deal” Brexit, “and all the chaos that would come as a result of that”. Labour’s finance spokesman, John McDonnell, said May could eventually get a deal through parliament if she negotiated a compromise with the opposition party, which wants a permanent customs union with the EU, a close relationship with its single market and greater protections for workers and consumers.